Lady Bird Lake is the epitome of the Austin lifestyle. Every day of the week, the lake is filled with people taking advantage of this stretch of dammed-off Colorado River that offers endless recreation opportunities. Backdropped by the downtown Austin skyline on one side, Zilker Park and Auditorium Shores on the other, and featuring the Ann and Roy Butler Hike and Bike Trail, this entire section of Austin represents the enthusiasm locals have for the outdoors. With eight official access points (and endless other places to put-in or take-out), the reservoir is a great place to spend a day on the water, be it on your lunch break or all day on a Sunday. Lady Bird Lake features paddling with a view, with the city’s skyline visible most of the time. You can explore paddling-designated lake trails or you chart your own course. You also have access to Barton Springs Pool or Deep Eddy Pool, both of which are spring-fed Austin pools that are open year round. There are several places to rendezvous on the lake’s shores, including Festival Beach and Red Bud Isle. You’ll find paddlers up and down the shores basking in the shade of the Hill Country’s signature cypress trees and on the beach areas along the way, particularly during the spring and summer months when locals take up residence for hours. 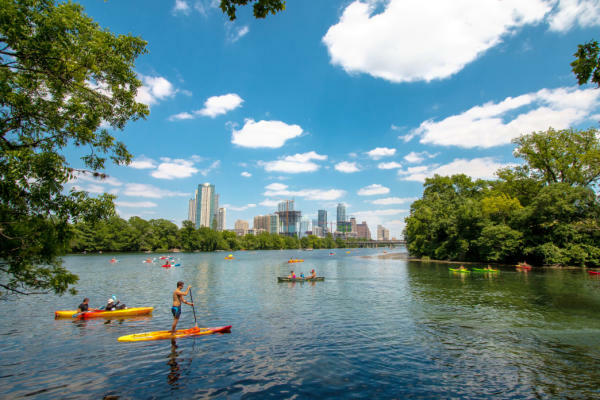 If you’re visiting or don’t have your own kayak, canoe, or SUP, several Austin businesses line the lake’s shores, offering equipment rental and guidance to navigating the lake. People love the lake’s proximity to downtown and its ease of access. And with rentals on the lake shore, it makes getting into the water quick and easy for visitors. It’s a safe haven for families since there are no motorized boats on the water, making it a great place for children to learn the ropes on the lake. Because there is no motorized boat traffic on Lady Bird Lake, paddlers of any kind can take full reign over the lake. Leisurely paddlers, fitness enthusiasts, and even rowing teams practice between Longhorn and Tom Miller dams. The lake is calm and easy to navigate, with plenty of distance for those counting their miles. There are 8 official access points along Lady Bird Lake, allowing you to access multiple lake trail options. Depending on where you’d like to access the lake, parking will vary. There is free and abundant parking at Zilker Park, though the park does get busy and can fill up. Otherwise, you can park at Red Bud Isle, Auditorium Shores, or any of the other entry points on the above map. There is also boat rental access at Zilker Park, the Rowing Dock, and Texas Rowing Center, among other local places. None. Accessing Lady Bird Lake is free, with the optional cost of equipment rental at several local lakeside businesses. Dogs are welcome on the lake at their owner’s discretion. In fact, Red Bud Isle is a section of the lake that’s doubles as an off-leash dog park, lined with giant cypress trees, park benches, and shady groves.